Abstract: We'll look at SUSE Personal 9.1 and explore the process of installing Linux onto your hard drive as a full operating system. In the first part of PCstats Beginner's Guide to using Linux, we explored the basic features of this open-source operating system by using the Knoppix 'live' CD Linux distribution which does not require a permanent installation onto your computer's hard drive, but instead loads entirely from a single CD. For the second installment of this guide, we're looking at something a little more permanent. 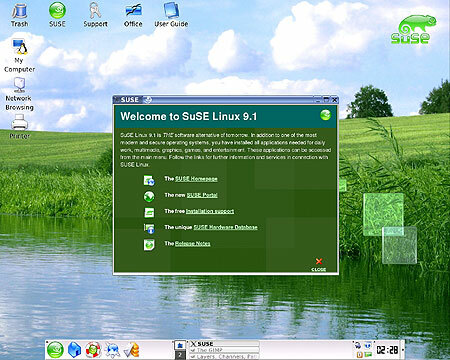 We're going to take one of the most popular and easy to use free Linux distributions, SUSE Personal 9.1 and explore the process of installing Linux onto your hard drive as a full operating system. We'll look at how to configure your desktop using the KDE desktop manager, get a grasp on your personal files in the Linux file system and connect to the Internet for web browsing and email. We'll also teach you how to make Linux co-exist peacefully with your existing Windows installation, so you can use both. Please note that this is by no means a comprehensive guide to using Linux 'behind the scenes' and becoming an expert at that operating system. The information in this article is intended to get you up and working comfortably using the SUSE 9.1 Personal edition Linux distribution. This particular version of Linux was chosen because its small footprint and easy to use configuration tools make it an excellent way to reduce the often-daunting learning curve that the Linux OS can present. We firmly believe that learning to use an operating system productively is the first and most important step in achieving full familiarity and expertise with that system. Intel, AMD or compatible x86 system with 128MB of memory minimum. We'd recommend at least a 500MHz processor to get the most out of the operating system, but this is not a requirement. At least 500MB of free, unpartitioned hard drive space to install Linux on. This space can be on an empty drive, an unpartitioned portion of a drive, or a drive partition which you can afford to erase. A CD-R/RW drive (or access to one) and broadband Internet access to download the SUSE disk image. Since the image is very large (700MB) there's not really much point in downloading it if you don't have a fast Internet connection. One of the major reasons we chose SUSE Personal 9.1 for this guide is the fact that it comes on only one CD, whereas many other major Linux distributions take two or more. Download the SUSE 9.1 Personal .ISO image file from here, then burn it to CD using your favourite CD creation program. If you need some help with this process, see our guide to the subject here. No special settings are required to burn this CD, though you will need to finalize the disk.